How to Select the Best Gas Pole Chainsaw? If you’ve decided it’s a gas powered pole chainsaw you are after, chances are you are in need of something that can reach up in high places. When selecting the best gas pole chainsaw for the money, you need to first identify your requirements. This will help you choose the right pole chainsaw for your needs for the right price. Not everyone in need of a chainsaw is in need of a gas powered chainsaw on an extendable pole or stick. These chainsaws are largely used for getting into those hard-to-reach places such as hedges and dense trees. They are generally not used for cutting logs for firewood. Some gas pole chainsaws have the ability to be used as a chainsaw without the extendable pole for cutting limbs, but its design and capacity doesn’t make it the best machine for that job. Gas powered pole chainsaws are aimed at removing some of the danger involved with using a chainsaw. This is due to the reach it has with its pole, allowing you to have both feet planted firmly on the ground. This feature alone makes it slightly safer than its pole-less counterparts, but chainsaws are still dangerous and all care must be taken. Always stay balanced on two feet, use ladders with care, take breaks to avoid fatigue, and don’t use a pole chainsaw above your capabilities. If the chainsaw is too heavy, have a professional take care of the job. Gas powered pole chainsaws are an excellent innovation, and one that has taken a lot of the hard work out of the jobs of arborists and landscapers. This in itself creates a whole new level of efficiency. No longer do you need to rely on a ladder for those hard to reach limbs. Nor do you have to precariously balance a chainsaw while trying to get closer to a tree. There is no doubt that manufacturers of top rated gas powered chainsaws on a stick are providing an extremely efficient product for those who require a job done effectively. Gas powered pole chainsaws generally boast the same features as a standard petrol chainsaw. Low emission engine to reduce smoke and burning. Electronic ignition systems for a much quicker start. Automatic chain oiler for added convenience of not having to do it yourself. Anti-vibration to reduce user fatigue and for easier handling. Balance for better weight distribution and safer use. There is a fair amount of maintenance required for a gas powered chainsaw – regardless of the brand. However, the same amount is required for a gas powered pole chainsaw. Keeping fuel, oil and lubricant topped up. Cleaning any debris, grease and grime from the chainsaw. Cleaning break bands, the bar, air filters, cooling fins, air intake and flywheel. Changing and checking spark plugs. Checking for loose bolts and screws and tightening accordingly. Whatever your budget may be, you are sure to find the best gas pole chainsaw for the money. The price of gas powered pole chainsaws varies online from as little as $99 for a basic model, all the way through to $800 for a commercial grade model. The end goal is to find something that’s not only affordable, but provides all the safety features without compromising on efficiency. It has an auto oiler for user convenience. It has a 7 foot extension pole to enable you to get into those hard-to-reach places. It is compatible with attachments to turn it into other power tools such as blowers and edgers. It has exceptional pull-start technology for easy starting. It doesn’t come with a shoulder strap like most other brands. The high speed jet runs a little rich. Some of the parts aren’t made out of quality materials and break easily. It requires too many tools to make adjustments to parts. A12 x 10.8 x 38 inches. QWhat branch diameters can it cut? QCan you use it as a regular saw without the stick/pole? QWhat is the fuel mix ratio? The Remington RM2599 is a cost-effective option when you’re looking to get that much needed home maintenance completed. It offers exceptional power in comparison to its cost, and it has so many options to turn this chainsaw into another power tool such as an edger or blower. It does have its flaws in terms of part quality and availability, but for those who require a tool that will get small jobs around the home completed well, this is the tool for the job. Check out what other people who purchased this product think about it. Read Remington RM2599 gas pole chainsaw reviews. It has a 12-inch bar for greater tree cutting variety. It has an E-Tech II engine for easy starting. It’s comfortable to use with a rear-mounted engine. It’s more suited to professionals rather than homeowners which can limit the market reach. 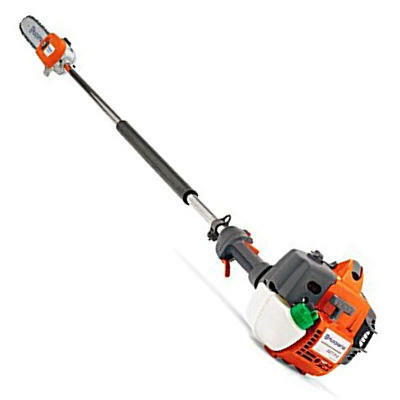 Professional Husqvarna 327P4 gas pole chainsaw. QWho is the saw best targeted to? For the professional arborist or the homeowner with a lot of maintenance to take care of, the Husqvarna is for you. It has rapid acceleration, it’s easy to start, and has a versatile cutting head to allow you more variety in the trees you can cut. It’s also very lightweight in comparison to the power it has, and has an adjustable cutter-head for your convenience. Overall, this chainsaw is one that packs a real punch when put up against its competitors in the market. Check out what other people who purchased this product think about it. Read Husqvarna 327P4 gas pole chainsaw reviews. It can reach up to 12 feet with its 7 foot pole and saw. It has two height options. It has the option to add other attachments to turn it into a different power tool. Factory adjustments often aren’t right for use right out of the box. The bar oil flow doesn’t let out enough oil and needs adjusted. The saw housing is plastic. Not as powerful as other options on the market. A4.4 x 35.8 x 5.9 inches. 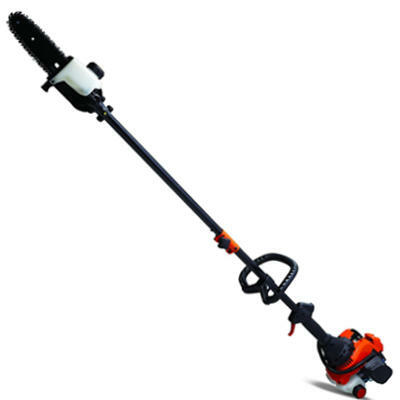 For an average homeowner with minimal maintenance, this TrimmerPlus pole chainsaw is a good option. It gives off the impression that it is cheap with its plastic casing, but its motor, flexibility with use and the lightweight feel make up for that. Its ability to be turned into other power tools is also a great benefit, saving room in the garden shed. Check out what other people who purchased this product think about it. 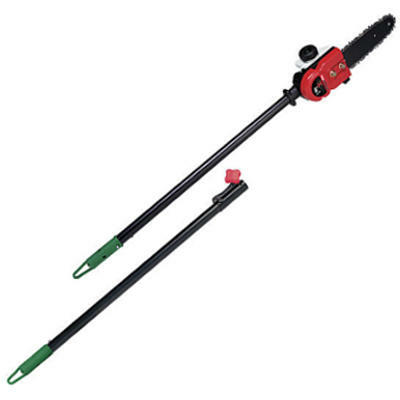 Read TrimmerPlus PS720 gas pole chainsaw reviews. It cuts branches up to six inches in diameter. It has a sure-fire starting system. It has a 12 foot reach. It can be hard to start. The oil reservoir can leak when in storage, so it pays to drain it before storing it. A74.5 x 10.5 x 10 inches. QWhat CC rating is its engine? The Poulan Pro won’t win any awards for quality or design, but its reliability and easy maintenance will ensure it can hold its place in any homeowner’s tool shed. 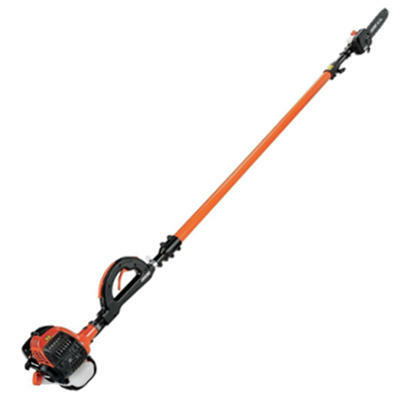 It’s clean running, does what it says it does, and its 8 inch chain ensures a clean cut through branches of around 6 inches in diameter. The manufacturers have ensured this model is priced well in the market and appeals to a wide audience. Check out what other people who purchased this product think about it. Read Poulan Pro PP258TP gas pole chainsaw reviews. It has an ergonomic top handle which makes it comfortable to operate. It has side access tensioning for a safer way of tightening the chain. It’s robust and cuts well with a sharp chain. It has a great extension pole. Compared to other pole chainsaws on the market, it’s heavy. There is no base plate to sit it down on to stop it rolling over. The trigger release is located too far forward. Air intake is in the wrong place, causing air stalling. A72 x 12 x 12 inches. The ECHO 25.4cc gas powered pole chainsaw offers a lot of flexibility to homeowners with various flora and fauna needing trimmed back. There are three extension options, as well as a reliable motor that will allow you to get a full day’s work done. It’s comfortable to use, it has low vibration which reduces user fatigue, and it’s well priced in the market against its larger competition. Overall, it’s a saw that would suit the majority of households. Check out what other people who purchased this product think about it. Read ECHO gas pole chainsaw reviews. Where to Buy Gas/Petrol Pole Chainsaws? Gas/petrol pole chainsaws can be found for sale in many hardware stores. However, the best place to get a good deal and find out all information you need to know is online. Websites such as Amazon are goldmines when it comes to sourcing the best deal and reviews to see whether a particular manufacturer, brand or model is worth the money. To get the best gas pole chainsaw for the money, you are best to stick to the online market. This is where you have access to a range of options for both homeowners and professionals.